Back in the summer of 2013, the Treasury Borrowing Advisory Group made a very explicit plea to the Treasury (and the Fed): please help us, liquidity in bond markets is plunging; the plea was so loud the Fed - whose monetization of Treasurys remains the primary culprit for the collapse in fixed income liquidity - promptly announced it would first taper, and then completely halt QE (at least until such time as Congress provided a generous surge in monetizable debt). It took the peanut gallery a few years to pronounce that "everyone is worried about bond market liquidity", even though this had been clear for years to anyone who actually traded bonds in these broken markets. A far more concerning development over the same period has been not so much the evaporation of equity, or debt, liquidity but that of the one "market" which central banks have no qualms about intervening on a daily basis: currencies. A recent example of just how thin liquidity had become in FX took place on March 18 during the infamous USD flash crash, when just after the market close, the USD index went, well, "crazy"
Furthermore, as we also discussed in the past year, one of the primary reason why FX liquidity has imploded is that after soaking up commodity, bond and equity markets in the past several years, HFT firms such as Virtu decided to make FX their latest trading arena. And while the practical impact of collapsing liquidity in this last remaining asset class was also quite clear to market participants, especially those who relish the daily USDJPY stop hunts, there had been little theoretical work done on analyzing just how bad said liquidity vacuum had become. There has been further deterioration of this measure of liquidity across 8 out of 12 commonly traded G10 pairs. EUR/crosses in particular have suffered, with EUR/USD and EUR/JPY seeing the largest declines, further evidence of how painful euro funding unwinds have been for investors. The bottom line: "liquidity in EUR/USD is closing in on the lowest levels save after the Lehman bankruptcy, with only late-2010 worse." Other crosses reveals the same trend: "Liquidity has also fallen in USD/JPY but only towards its longrun average, while liquidity in GBP/USD has moderately improved but from low levels. While quoted bid-ask spreads are a different, and probably inferior, measure, interestingly they tell out the same story (see chart 5), with 3 year rolling percentiles very elevated in EUR/USD but low in USD/JPY. Turning to volumes, these continue a steady decline from late last year across G10 FX, a spike at this month’s Fed meeting notwithstanding (chart 6)." The above underscores the tricky current environment for risk allocation. The same message is provided by our Regime Machine indicator released today which shows our measures of trend (VHF), uniformity (cross correlation between currency pairs) and smoothness (inverted realized vol) to have collapsed to historical percentile lows, the worst possible conditions for momentum strategies. And here, for the visual learners, is DB's complete chart pack showing that there really is no way out: the moments a massive inversion in sentiment arrives, the FX market will simply go bid-or-offerless as all the HFT-driven fake liquidity in the market disappears with the switch of a button. One of the biggest issues investors need to assess today is the US Dollar carry trade. If you’re unfamiliar with the concept of a carry trade, it occurs when you borrow in one currency, usually at a very low interest rate, and then invest the money in another security, whether it be a bond, stock or what have you, that is denominated in another currency. More often than not, you invest directly in the other currency itself, pocketing the difference in interest rates. So if the US Dollar pays 0.25% and the Yuan offers 5% for example, you borrow Dollars and invest in Yuan and pocket the 4.75% difference. Now a carry trade only works when the currency you are borrowing in remains weak. As soon as it begins to strengthen, you profits not only evaporate but you can end up deep in the red (remember you’ve borrowed $100 for every $1 you have in capital). Globally the US Dollar carry trade is north of $9 trillion: larger than the economies of Japan and Germany combined. And it began to blow up in July of 2014. 1) The currency market is much larger and more liquid that bonds or stocks and so reacts more quickly to changes in the global economy. 2) It takes time for currency moves to begin to affect profits and profit margins, which affect stock prices. 3) Of major asset classes, stocks have the largest percentage of individual or retail investors who are less likely to be aware of changes occurring in the financial system. The bottom line is that when currencies begin to blow up it takes time for the rest of the financial world to catch on. This is particularly true for stocks. With that in mind, consider that the global US Dollar carry trade began to blow up back in July 2014. While most commentators focused on the impact this had on Oil, the REAL damage was done in the emerging market currency space. Below is a chart showing the US Dollar/ Chilean Peso (black), US Dollar/ Brazilian Real (blue), US Dollar/ Mexican Peso (red), US Dollar/ South African Rand (red), and US Dollar/ Singapore Dollar (pink) currency pairs. As you can see, between the middle of 2014 and today, ALL of these pairs have seen price swings ranging in size from 16% to 26%. These are ENORMOUS movements for currencies. Imagine losing 25% of your purchasing power in the span of a single year. This ONLY happens when the financial system is under incredible duress. Indeed, across the board, Emerging Market currencies are collapsing against the US Dollar, falling to the lowest levels since 2001! Many investors were not aware of this level of distress because they focus on stocks. However, the US stock market finally began to “get it” in August 2015. This is not over by any means. As I mentioned before, the US Dollar carry trade is over $9 trillion in size. This is larger than the economies of Germany and Japancombined. The worst is yet to come and smart investors are preparing now, BEFORE it hits. At first blush, it may appear great for business to have access to cheap financing. But what may be good for any one business is not necessarily good for the economy. When interest rates are artificially depressed, it can subsidize struggling enterprises that might otherwise be driven out of business. As a result, productive capital can be locked into zombie enterprises. If ailing businesses were allowed to fail, those laid off would need to look for new jobs at firms that have a better chance of succeeding. As such, the core tenant of capitalism: creative destruction, may be undermined through ZIRP. In our assessment, the result is that an economy grows at substantially below its potential. Investors may have enjoyed the rush of rising asset prices as a result of ZIRP. However, this may well have been a Faustian bargain as the Federal Reserve (Fed) and other central banks have masked, but not eliminated, the risks that come with investing. Complacency has been rampant, as asset prices rose on the backdrop of low volatility. When volatility is low (more broadly speaking, we refer to "compressed risk premia"), rational investors tend to allocate more money to historically risky assets. While that may be exactly what central banks want - at least for the real economy - investors may bail out when volatility spikes, as they realize they didn't sign up for this ("I didn't know the markets were risky!"). We believe that until early August this year, investors generally "bought the dips" out of concern of missing out on rallies. Now, they may be "selling the rallies" as they scramble to preserve their paper gains. This process is driven by the Fed's desire to pursue an "exit." For more details on this, please see our recent Merk Insight "Lowdown on Rate Hikes." But it's not just bad because asset prices might crumble again after their meteoric rise; it's bad because, in our analysis, ZIRP has driven fundamental analysts to the sideline. For anecdotal evidence, look no further than the decision by Barron's Magazine to kick Fred Hickey (who may well be one of the best analysts of our era) out of the Barron's Roundtable. Instead, money looks to be flocking towards investment strategies based on momentum investing, a strategy that works until it doesn't. Again, ZIRP gives capitalism a bad name because we feel it disrupts efficient capital allocation. ZIRP: Bad for Main Street? Excessively low interest rates are also bad for Main Street. In our analysis, excessively low interest rates are a key driver of the growing wealth gap in the U.S. and abroad. Hedge funds and sophisticated investors seemed to thrive as they engaged in highly levered bets; at the other end of the spectrum are everyday people that may not get any interest on their savings, but are lured into taking out loans they may not be able to afford. We believe ever more people are vulnerable to "fall through the cracks" as they encounter financial shocks, such as the loss of a job or medical expenses; hardship may be exacerbated because people had been incentivized to load up on debt even before they encountered a financial emergency. Again, we believe ZIRP gives capitalism a bad name, although ZIRP has nothing to do with capitalism. Low interest rates may not even be good for home buyers: it may sound attractive to have low financing cost, but the public appears to slowly wake up to the fact that when rates are low, prices are higher: be that the prices of college tuition or homes. It's all great to have high home prices when you are a home owner, but it's not so great when you are trying to buy your first home. ZIRP: Bad for Price Stability? While we believe inflation may ultimately be a problem if interest rates are kept too low for too long, ZIRP may temporarily suppress inflation. While this may sound counter-intuitive, it is precisely because of the aforementioned capital misallocation ZIRP may be fostering: when inefficient businesses are being subsidized, as we believe ZIRP does, inflation dynamics may not follow classical rulebooks. That's because an economy with inefficient capital resource allocation experiences shifts in supply of goods and services that may not match demand leading to what may appear to be erratic price shifts. The most notable example may be commodity prices, where the extreme price moves in recent years are a symptom that not all is right. in contrast, fiscal policy - through tax and regulatory policy - focuses on how this credit gets allocated"
If the Fed now allocates money to a specific sector of the economy, say, the mortgage market by buying Mortgage Backed Securities (MBS), they meddle in politics. Calls to "audit the Fed" are likely a direct result of the Fed having overstepped their authority, increasingly blurring the lines between the Fed and Congress. More importantly, the U.S., just like Europe and Japan, face important challenges that in our opinion can neither be outsourced, nor solved by central banks in general or ZIRP in particular. "Central banks can provide liquidity, but not solvency." UK's Labor Party Jeremy Corbyn. And what do just about all politicians - not just the ones mentioned above - have in common? They rarely ever blame themselves; instead, they seem to blame the wealthy, minorities or foreigners for any problems. 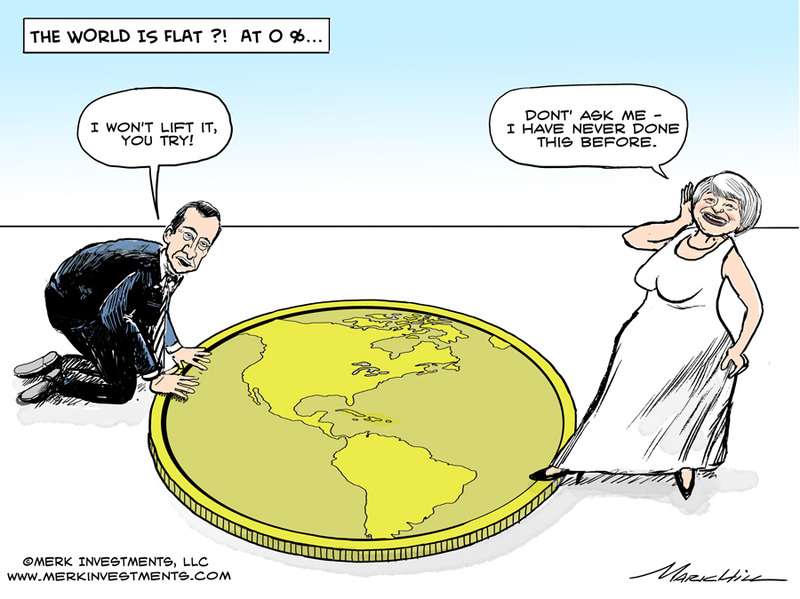 We believe the key problem many countries have is debt. I allege that if countries had their fiscal house in order, they would rarely see the rise of populist politicians. While there are exceptions to this simplified view, Ukraine may not be one of them: would Ukraine be in the situation it is in today if the country were able to balance its books? Central banks are clearly not appointing populist politicians, but we allege ZIRP provides a key ingredient that allows such politicians to rise and thrive. ZIRP has allowed governments to carry what we believe are excessive debt burdens though ZIRPs cousin quantitative easing ("QE"). QE is essentially government debt monetization in our view. Take the Fed's U.S. treasury buying QE program. Those Treasuries (or new Treasuries that the Fed rolls into) might be held indefinitely by the Fed (despite claims of balance sheet normalization) - meaning that US Government will never pay the principle, and the U.S. Government effectively pays zero interest on that debt because the profits of the Fed flow back to the US Treasury. ZIRP allows governments to engage on spending sprees, such as a boost of military spending Prime Minister Abe might pursue. The Great Depression ultimately ended in World War II. I'm not suggesting that the policies of any one politician currently in office or running for office will lead to World War III. However, I am rather concerned that the longer we continue on the current path, the more political instability will be fostered that could ultimately lead to a major international conflict. It's about time we embrace what we have been lobbying for since the onset of the financial crisis: the best short-term policy is a good long-term policy. We have to realize that when faced with a credit bust, there will be losers, and that printing money cannot change that. In that spirit, we must not be afraid of normalizing policy in fear of causing an economic setback. When rates rise, businesses that should have failed long ago, are likely to fail. Rather than merely rising rates, though, policy makers must provide a long-term vision of the principles that guides their long-term policy. In our humble opinion, "data dependency" is an inadequate principle, if it is one at all. The Fed needs to have the guts to tell Congress that it is not their role to fix their problems. It requires guts because they must be willing to accept a recession in making their point. 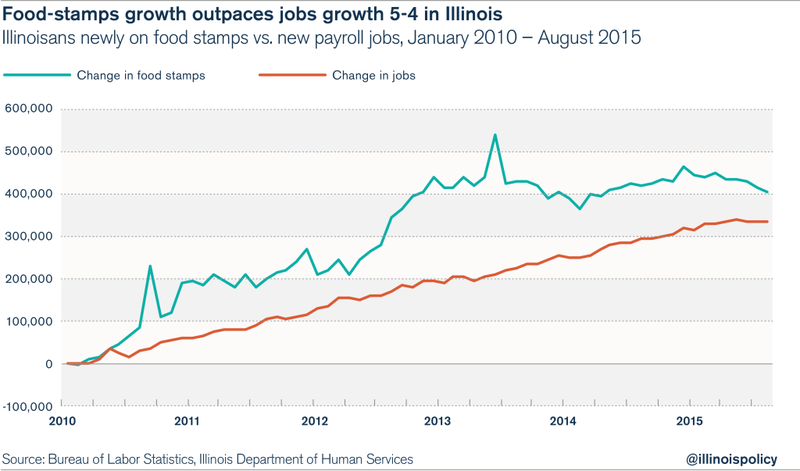 Obamanomics: Food Stamp Growth Outpaces Jobs In Illinois During "Recovery"
Illinois is the only state in the Midwest to have added more people to food-stamp rolls than to employment rolls during the recovery from the Great Recession. Job losses from the Great Recession occurred from January 2008 to January 2010, and since then, states have had five-and-a-half years of recovery. In every other Midwestern state, jobs growth has dramatically outpaced food-stamps growth during the recovery. In fact, in every other state in the region, jobs growth dwarfs food-stamps growth. 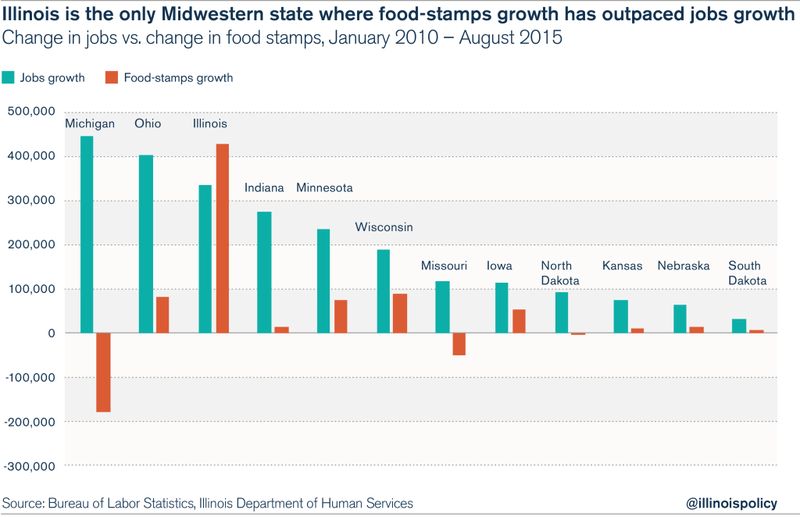 But during the recovery, Illinois put more people on food stamps than every other Midwestern state combined. Manufacturing has borne the brunt of Illinois’ policy failures. From the state’s broken workers’ compensation system, to the highest property taxes in the region, to the lack of a Right-to-Work law while surrounding states enact Right to Work, Illinois has the worst policy environment in the Midwest for manufacturers. The result for Illinois factory workers? The Land of Lincoln has put 25 people on food stamps for every manufacturing job created during the recession recovery. And the recovery that Illinois’ manufacturers have experienced has been especially anemic. After losing 117,000 manufacturing jobs during the recession, Illinois has only regained 17,400 of those factory jobs since January 2010. Meanwhile, the other Great Lakes states have pulled far ahead of Illinois during the recovery. Michigan has added 135,600 manufacturing jobs, Indiana has added 80,400, Ohio has added 74,500 and Wisconsin has added 48,700. Illinois’ lack of jobs growth, especially in blue-collar industries, has driven more and more Illinoisans to dependency on government, while residents of the other Great Lakes states join the ranks of the employed and leave the food-stamps program. Michigan surpassed Illinois in 2014 for manufacturing jobs created, while Illinois has surpassed Michigan for the percentage of residents on food stamps. 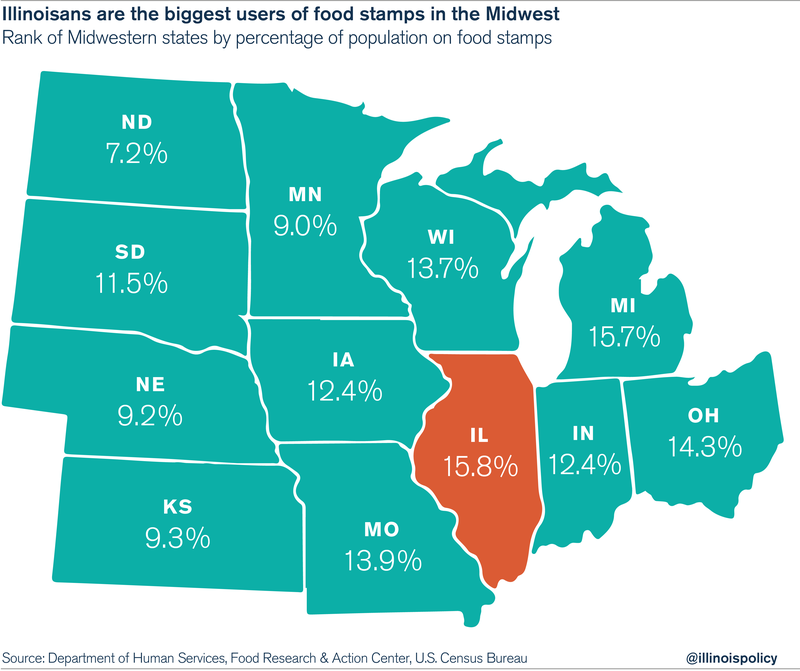 Illinoisans depend on food stamps more than do the residents of any other state in the region. IS THE FED PREPARING FOR QE4 OR EVEN WORSE: "HELICOPTER MONEY"? Since the start of June, global equity markets have lost over $13 trillion. World market capitalization has fallen back below $60 trillion for the first time since February 2014 as it appears the world's central planners' print-or-die policy to create wealth (and in some magical thinking - economic growth) has failed - and failed dramatically. To rub more salt in the wounds of monetray policy mumbo-jumbo, despite endless rate cuts and balance sheet expansion around the world, the last 4 months have seen an 18% collapse - the largest since Lehman. NON OF THIS WORK OF COURSE! WHAT THE MAINSTREAM MEDIA IS NOT SHOWING - But the fed is well aware of! FRA Co-Founder Gordon T. Long talks Financial Repression and current economic developments with Don Rissmiller, a founding partner and chief economist of Strategas Research Partners. Mr. Rissmiller has overseen Strategas macroeconomic research since 2006, as well as thematic research, and high frequency econometric forecasting. The Fed took the approach that they would like to wait a little more and see some more data. This is not uncommon, if we look back to 2013 to see an example of this, the Fed started talking about the quantitative easing taper in the middle of 2013, and by Sept 2013 the expectation was they were ready to go, but they held back for 3 more months because of the tightening of financial conditions. Considering the global slowdown in world trade and commodity prices, Rissmiller shares some foresight into the potential future of the American economy. “In housing we are seeing some improved signs on household formation. As unemployment is looking more normal we have had more household buying."